One of the things I often type into my biographical statements is: Commitment to collaboration guides her work. But what does collaboration mean? How do we know collaboration when we see it? Is there a good way to measure it? If this sounds familiar to you, I have recently answered these questions on another forum. I spent a lot of time thinking about collaboration in the context of a now-wrapped-up evaluation of intimate partner violence (IPV) prevention efforts supported by the Centers for Disease Control's DELTA FOCUS (Domestic Violence Prevention Enhancements and Leadership Through Alliances, Focusing on Outcomes for Communities United with States) project. DELTA FOCUS was a five-year primary prevention initiative that funded ten state domestic violence coalitions to implement and evaluate IPV prevention strategies at the community or societal levels of the social-ecological model (AKA “outer layers of the SEM”). Along with Wendi Siebold at Strategic Prevention Solutions, I was part of the the Empowerment Evaluation team contracted by the Florida Coalition Against Domestic Violence to document, showcase, and improve their prevention efforts. To evaluate the success of coalition-building as a prevention strategy, we needed to measure increases in the ability of organizations to work collaboratively, i.e., we needed to observe changes in collaboration. Which required an understanding of what collaboration is: what does collaboration mean? One understanding comes from Chris Huxham, who has noted that collaboration is just one of a variety of different ways that organizations (or individuals) can work together. Her typology of these different levels of functioning are additive, with collaboration being the highest level. I've illustrated Huxham's (1996) concepts below (and also here). But what does collaboration really mean? Huxham notes the the key difference between collaboration and cooperation is that groups that achieve collaborative functioning do so by improving each others' capacity. And, as I've previously illustrated, capacity building is an approach I use to get closer to my goal of better intervention. Another place you can read about different levels of working relationships is at the Community Toolbox, a resource for all kinds of community-based efforts. So, how do we know collaboration when we see it? Drs. 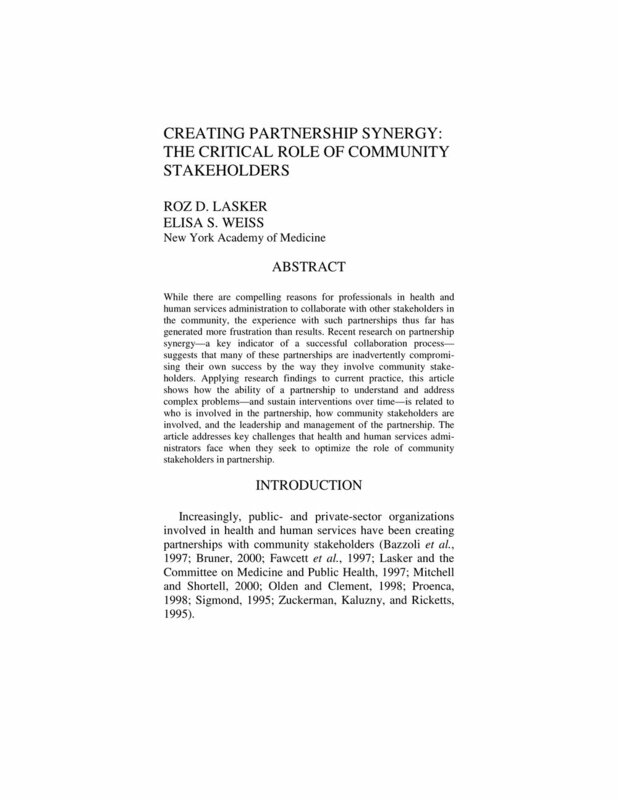 Roz D. Lasker and Elisa Weiss -- while at the Center for the Advancement of Collaborative Strategies in Health at the New York Academy of Medicine -- developed a practical framework that specified SYNERGY as the observable output of collaboration. The series of papers that outlined the theory and supplied evidence to back it up were fascinating, and affirming, to me. Synergize is also the sixth habit of highly effective students (Habit 6: Synergize -- Together is Better) that my kids have learned in school, and which I referenced here. Though SYNERGY may be, by now, dangerously close to making a list of irritating jargon phrases, its specific meaning as an indicator of collaboration has been very useful in my work. I especially like that SYNERGY can be measured with the Partnership Self Assessment Tool, which includes nine Likert-type questions that collectively assess the degree of SYNERGY within a group. Since I found the tool several years ago, I have used in multiple projects. The PSAT also includes measures of other things that are related to SYNERGY (e.g., leadership, satisfaction with partnership), too! Please reach out to me to hear how I've applied these ideas in my program evaluation and consultation work. I'm happy to tell you lots more.